In Targi you are a Tuareg tribe-nobelman trying to have the largest tribe amongst all the Tuareg tribes. To successfully achieve this you need to be successful in your travels and trades. 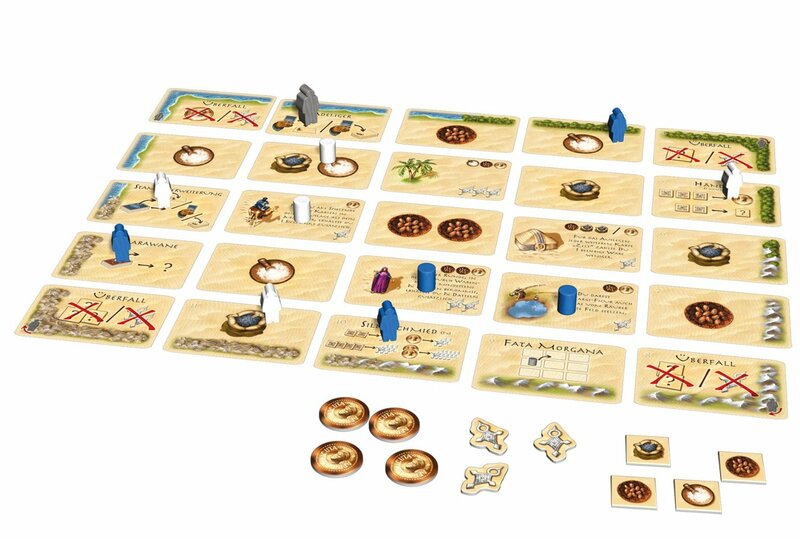 You travel across the desert trading at every oasis. In the game this is done by placing your workers on actions on a matrix of spaces. You have three workers that you place at spaces around the edge of the matrix. The twist is that the point where your workers intersect in the matrix, you take a fourth and fifth action. You take turns placing your workers, so out guessing what action your opponent want in the middle of the board and placing a worker before he does is a lot of what the game is about. The actions you can take let you earn various resources and discover oasis cards where you can stop and trade. There is a set collection aspect to the oasis cards so another aspect to take into consideration when placing your workers is what oasis cards your opponent wants. It is a tight game where every action matters and you sit with a knot in your stomach while you silently wait for your opponent to place their worker, intensely hoping that they won’t see the obvious move they can take that will foil all your plans. Targi is one of my favourite games and has been for quite some time. It is one of the few strategic games that works very well with only two players. Of cause for some people the limit to two players will mean that they never get it to the table, and for others the lack of theme (look below) will make this game feel dryer than a bucket of desert sand. But for someone like me where gameplay comes before theme, it is perfect. It is intense and hits that nerve I love where you nervously awaits your opponent’s move. Those nail-biting moments make this game for me, and the rest of the game serve to make these moments shine. I love how this game brings a brilliant meta-game of getting into your opponent’s head, to a solid set collection and trading game. If you love games of high interpersonal tension and like a good trading and set collection game you will have a lot of fun here. I know from experience this game isn’t for everyone, but for people like me who like it, they all REALLY like it. So if you like strategic games and are looking for a solid two player game, go get a copy of this gem. As I mentioned above this game isn’t a strongly thematic game. You don’t feel like you are a nomad walking through the desert, you feel like you are a person trying to outwit another person. And that is perfectly fine for me. For others it won’t be. The game looks good, but nothing outstanding. Classic ‘German-games’ illustrations and components. The game rules are clear and beautifully laid out and the card, box and component quality is really good. This game is light and easy for people who have played other strategic games. If this is your first strategic game you might find it a little daunting, but most people should grasp the game within a play or two.